A garage door has several components that allow it to open or close in a safe manner. A garage door cable, also known as the lifting cable, is attached to the garage’s bottom bracket of counterbalancing mechanism. The cables are strong and flexible enough to lift the heavy loads and rolling the wound over the drum or pulleys. Garage door cables are available in great variety with Garage pros to fit different garage doors. We carry a huge variety of garage door cables that may either be used with extension spring garage door or torsion spring garage door. All the overhead cables we have are high quality cables that are also used to carry out garage door repair and installation work. You may also request a custom length cable by getting in touch with us. We have almost all the sizes of garage door cables with appropriate thickness to fit your needs. For instance, 14 inches gauge steel will not function well on the garage door which is small. Thus, we have the 11-inch gauge steel cable as well. We just carry the garage door opener cable bearing apt thickness to do your job. If your garage door cable shows signs of wearing, call us now. 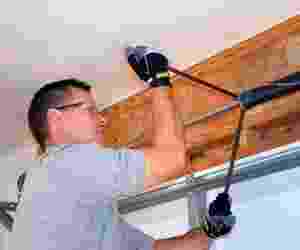 Besides the garage door cable, you must also avail garage door inspection services from Garage Pros. Our team of garage door specialists highly recommends regular inspection of garage door cables in order to detect the signs of sagging and fraying at an earlier stage itself. Till now, our professionals have replaced thousands of garage door cables. You cannot deny that garage door has a great function to perform. It keeps your vehicles safe from the external weather and from outsiders. Garage doors can also increase the value of your property. Garage Pros carry a range of garage doors suiting almost every kind of home. Not only doors, but also we have the complete line of garage door parts and components to allow the garage door function seamlessly. You may choose among the variety of garage doors from us. Apart from this, our skilled and highly trained technicians are added advantage. They can help you to choose an apt kind of garage door suiting your needs. We also supply the garage door parts like cables, springs, screws and various types of mechanisms or systems to repair the garage doors when they break down. Our technicians are all extremely trained in using modern tools and equipments. Homeowners are least careful about their garage door cables but it is important to pay utmost attention to the cable. If you find any of the signs of wear, call our technicians. 24X7 hours of emergency cable repair and garage door repair services may be taken from Gulliver Garage Doors. When it comes to garage door cables, only an expert can repair it. So, get in touch with us now.